Geographers organize information into five themes. republics)? How is the country similar to any of its neighbors (traditions, language, climate)? • Movement The question, How do people, goods, and ideas move from one location to another? refers to movement. to the country (jobs, family, climate, war)? the mountains)? Why do you think people settled there (water, safety, food, natural beauty)? Scientists study the land and water that cover Earth. They also study how people live on Earth. The study of Earth and its people is called geography . Earth is divided into seven large landmasses called continents . You can see the continents on the map below. 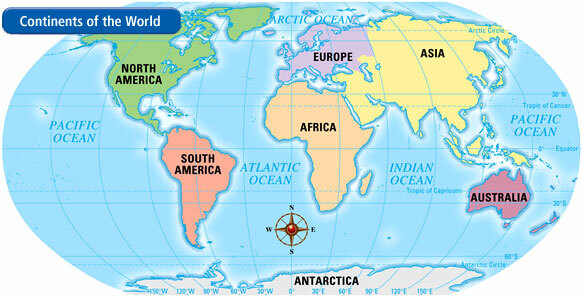 From largest to smallest, the continents are Asia, Africa, North America, South America, Antarctica, Europe, and Australia. * Geographers use maps and globes to measure and describe Earth. * We use maps to see natural and human-made features and to understand patterns. * Maps have changed over time to reflect people's increasing understanding of the world. One advantage of a globe is that it looks more like Earth, since both are round. A globe shows the viewer exactly how continents and oceans appear on Earth's curved surface. A globe also shows the true shapes, locations, and relative sizes of Earth's landforms and bodies of water. A map, on the other hand, is a flat representation of Earth's surface. It can be drawn to any size. No flat map can ever be as accurate as a globe. That is because Earth's surface is distorted somewhat when it is flattened to create a map. In other words, a map can alter how Earth really looks. But most people prefer to use maps because they do have several advantages. For one thing, a map lets you measure distances much more easily. For another, a map lets you see the world at a glance. Most important, it's much easier to carry a map because you can fold it up! Most maps have nine features, as shown in the map above. These features, described below, help you read and understand maps. • Title The title tells the subject of the map and gives you an idea of what information is shown. • Compass rose The compass rose shows directions: north, south, east, and west. • Legend The legend, or key, lists and explains the symbols and colors used on the map. • Lines of longitude These are imaginary lines that measure distances east and west of the prime meridian. • Lines of latitude These are imaginary lines that measure distances north and south of the equator. • Scale A scale can be used to figure out the distance between two locations on a map. • Labels Labels indicate the names of cities, landforms, and bodies of water. • Colors Colors represent a variety of information on a map. The map legend explains what the colors mean. To study Earth, geographers divide the globe into equal halves. Each half is called a hemisphere. An imaginary line called the equator divides the globe into north and south halves. The half of Earth north of the equator is called the Northern Hemisphere. The half south of the equator is called the Southern Hemisphere. Geographers use another imaginary line to divide Earth east from west. This line is called the prime meridian. The half of Earth west of the prime meridian is called the Western Hemisphere. The half east of the prime meridian is called the Eastern Hemisphere. As you can see in the diagram on the left, the United States is located in the northern and western hemispheres. The diagram also shows two globes marked with lines of latitude and longitude. As you have already learned, latitude lines lie to the north and south of the equator. Longitude lines go around Earth over the poles. These lines run east and west of the prime meridian. Geographers use a grid system to find the point where a latitude line and a longitude line cross. This point identifies an absolute location—the exact place on Earth where a city or other geographic feature can be found. Remember that location is one of the themes geographers use to describe Earth. Absolute location is expressed using the coordinates, or set of numbers, of the latitude and longitude lines. These coordinates are measured in degrees. Every place on Earth has only one ﻿absolute location﻿. For example, as you can see on the map on the following page, the absolute location of Rio de Janeiro, Brazil, is 23° south latitude, 43° west longitude. Latitude (shown as a horizontal line) is the angular distance, in degrees, minutes, and seconds of a point north or south of the Equator. Lines of latitude are often referred to as parallels. Longitude (shown as a vertical line) is the angular distance, in degrees, minutes, and seconds, of a point east or west of the Prime (Greenwich) Meridian. Lines of longitude are often referred to as meridians. Distance between Lines If you divide the circumference of the earth (approximately 25,000 miles) by 360 degrees, the distance on the earth's surface for each one degree of latitude or longitude is just over 69 miles, or 111 km. Note: As you move north or south of the equator, the distance between the lines of longitude gets shorter until they actually meet at the poles. At 45 degrees N or S of the equator, one degree of longitude is about 49 miles. Minutes and Seconds For precision purposes, degrees of longitude and latitude have been divided into minutes (') and seconds ("). There are 60 minutes in each degree. Each minute is divided into 60 seconds. Seconds can be further divided into tenths, hundredths, or even thousandths. Relative Location of a city or destination on the planet is its relationship to another place or nearby landmarks. Absolute Location is the definitive location of a place using a recognized coordinate system. Different maps help us see different things. The three basic types of maps are political maps, physical maps, and thematic maps. You have probably used all of these different types of maps. Political Maps Political maps show the features people have created, such as cities, states, provinces, territories, and countries. State and country boundaries can also be outlined on these types of maps. A political map of a smaller area, such as a state, often shows county boundaries. • Where on Earth's surface is this area located? • What is the size and shape of the area? How might its size or shape affect its people? • Who are the area's neighbors? • How populated does the area seem to be? Physical Maps On a physical map, you can see what Earth's surface might look like from space. 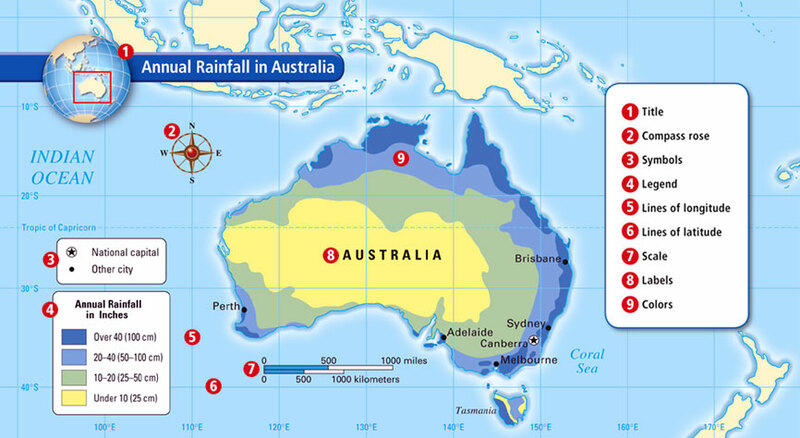 Physical maps show the landforms and bodies of water found in particular areas. Colors are often used to show elevations. On the map above, for example, brown indicates higher, more mountainous areas. Green shows areas that are relatively flat. Political and physical features are often shown on one map. When this information is combined, you can use it to help you better understand the region. 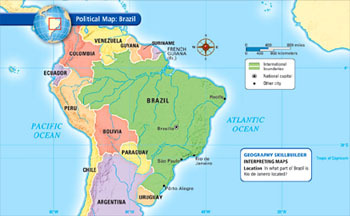 For instance, find the cities shown on the physical map of Brazil above. Notice that many of these cities are located near the coast. Like political maps, physical maps can help you understand specific characteristics of places. Here are some questions the features of a physical map might help you answer: •Are there mountains or plateaus in the area?•Near what physical features do most people live?•What is the area's range of elevation? How might higher and lower elevations affect people's lives?•In which direction do the rivers flow? How might this affect travel and transportation in the area? Thematic Maps A thematic map includes certain information about a place or region. 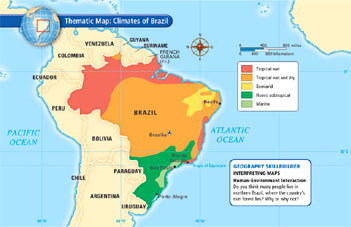 For example, the thematic map on this page shows the climates in Brazil. Thematic maps can use colors, symbols, lines, or dots to help you see patterns. The map's title and legend will help you understand the theme and the information presented. In this textbook, you will find thematic maps on such topics as historical events, vegetation, and population density. • Where in the world do people speak Spanish? • What are the natural resources of Africa? • What is the best route for sailing across the Atlantic? • Where and when did key battles take place during World War II? • Where were the major trade routes in Asia in ancient times? 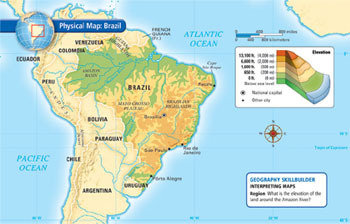 • Which type of map might help you find the highest mountain in Brazil?